This really quite blurry image just so happened to be taken right at a moment when we were taking a stumble. We kept on going anyway. I originally wrote this several weeks ago when I was having a wibbly day. I’ve been feeling not so good again lately, so I figured it would be a good time to post it. I struggle with things that many people find easy. I have to think my way through things that many people find intuitive. I’m anxious. Very anxious. Often. People sometimes treat me like I’m a fragile little flower. They see the ways I struggle and just assume that I must be delicate – they don’t bother to look any farther. They see how I am weak in ways that they are strong, and assume that must mean I am weak all over. The world may cater to the strengths of neurotypicals, and especially the strengths of extroverts, but that does not mean that my strengths don’t exist. Nor does it mean they don’t matter. I’m afraid a lot. 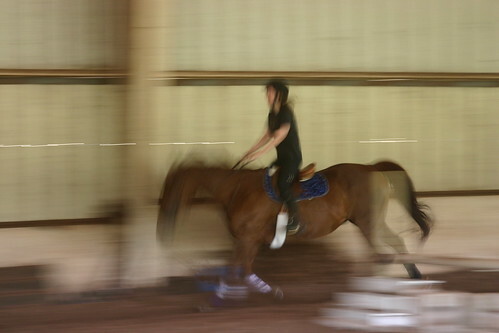 I’m even afraid of cantering during my horseback riding lessons. I’m afraid of talking on the phone. When I need to, I talk on the phone anyway. I am afraid of being honest about when there are ooky things going on inside my head. I talk about them anyway. There are lot of things I’m afraid of or that are overwhelming that I do anyway. I learn, I grow, I challenge myself, I do things. Yes, I need things. Things like accommodation, people to meet me part-way, understanding that I am not like most people and I don’t work the way they work. What I don’t need is pity, or condescending pats on the head, or assumptions that I just can’t handle anything difficult. Because I’m strong, that’s why. I’m stronger than I think I am, I’m stronger than many other people think I am, and I am darned well stronger than my fear. Do you ever feel weak? In what ways are you strong? If I should ever mistake you for weak, please take that strong backhand of yours and slap me upside the head. Because the last thing I think of when I see you is weak. I may not understand all your struggles or know *exactly* what you’re going through, but I can see how strong you are every time I see you. Do I feel weak? Yes right now at work in fact. I’m struggling under mounds of newly required paperwork for all projects. The part that is making me tremble is that we’re now responsible for tracking spending. I do not like accounting. At all. What so ever. And now I must do it at least weekly. And I’m not because I’m scare and it’s only making it worse. Where am I strong? In that I always have an open house. It can be hard sometimes and there are times when I really don’t want certain people in my house. But I made a promise to myself decades ago to have that open house, the one everyone knew they could go to if they had a problem, a place to crash, a place for tea, a place to hide (not legally, though). And that means having a very open door. And some days I really struggle with it, but the door, so far, has remained open. Do I feel weak? Absolutely. I struggle with group situations, I mean to the point where I don’t say anything. I am very analytical as well, so these replies get a lot of review (3 so far). I struggled with anxiety, depression and a range of other personal issues. Where am I strong? I work well alone, as I am doing now. Computers make sense to me, hence I am training to work in IT. I have great knowledge in my special interests. I agree with you, I want help, not pity. I, too, struggle with situations that others find easy but I try anyways. One of my “weaknesses” is fear of heights (even escalators) but I have gone parasailing and been on a cable car to get to the top of the Alps (granted, the first time I ended up on the floor). I did both again.. I feel if I keep doing what is very hard for me then one day (harp music playing) it will be easy. Hasn’t happened yet but I will keep doing things that are hard. I have many weaknesses. My strength is in refusing to let them stop me. Our “weaknesses” do not define us – how we handle them define us.